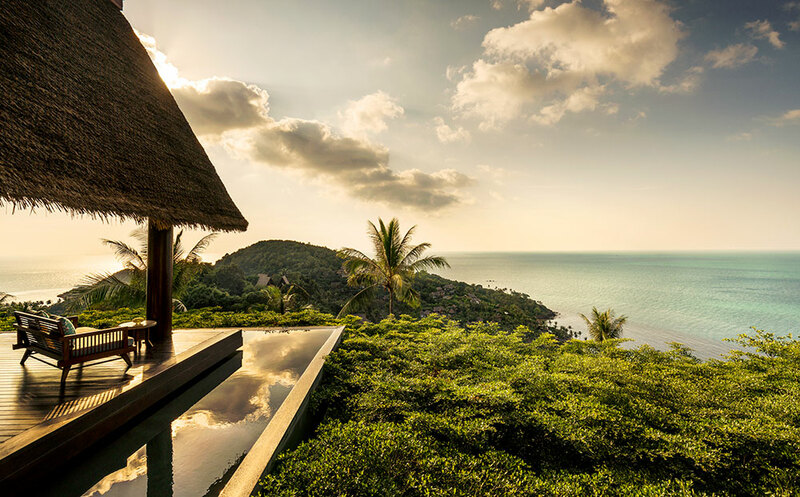 Since opening over a decade ago, Four Seasons Resort Koh Samui with its lush green tropical hillside location has become a favourite of those seeking an exclusive getaway. Life is slow here at this idyllic resort with its stunning views of the Gulf of Siam – but that doesn’t mean that time has stood still. Featuring 60 pool villas and 11 majestic private residences – all taking a design cue from southern Thai architecture, featuring thatched roofs and indoor and outdoor spaces inspired by the colours of the ocean – the resort on the northwestern tip of Koh Samui with a private beach has remained true to its island heritage with a gentle nod to the humble coconut. Koh Samui is after all referred to as “coconut island”, and the Four Seasons was built on the site of a former orchard, retaining 856 coconut trees. Among the latest additions is Asia’s first “Rum Vault” at CoCoRum Bar and Restaurant, offering the finest and most comprehensive collection of sugarcane spirits in the region. Set on the edge of a 50-metre-long infinity lap pool, a prison-like door opens into a cozy room with a tasting table as its centerpiece, surrounded by a stellar collection of rums from across the world. Working with Proof & Company, an award-winning bar and spirits team responsible for a number of the ‘World’s 50 Best Bars’, the CoCoRum cocktail menu features fresh interpretations of classic rum cocktails, bringing to life nearly 300 years of rum-drinking tradition in the Caribbean and other parts of the world. Using slow-pressed juices and exotic house-made ingredients infused with Thai flavours to surprise and delight the taste buds, the emphasis is on fine artisanal spirits and fresh local ingredients that shine through in the menu. The tropical cocktails of CoCoRum are perfectly complemented by a menu of indulgent Latin-American bites, as well as a selection of poolside international favourites. From Peruvian ceviche of freshly caught white snapper and Tiradito Nikki with tuna, to white snapper and sesame glaze, and King Crab Causa with avocado and huancaina sauce, the seafood menus inspire the palate. As do the meatier fare: Wagyu Beef Anticucho with chimichurri or just some Popcorn Chicken. At The Secret Garden Spa, a new suite of treatments has been introduced that unlock the hidden powers of nature. Inspired by the ancient wisdom hidden in Thailand’s herb gardens that revisit age-old wellness techniques, the treatments are designed to rejuvenate the body, mind and soul. This back-to-nature approach focuses on freshness, clarity and simplicity – enhanced by the tranquility of the spa’s beautiful garden setting and the pure natural goodness of plants and herbs grown at the resort. At The Secret Garden Spa, these treasured techniques have now been revived, such as the signature Kala Coconut Massage which uses pure warm coconut oil as well as the smooth shell of the coconut. Flowing strokes and firm pressure ease tense and aching muscles, while the warm aromatic oil hydrates the skin. The Secret Garden Scrubs use a secret blend of herbs: coconut oil and jasmine scrub for hydrating, nourishing and balancing; guava and kaffir lime leaf to boost vitamin absorption and cleanse the body; while lemongrass boosts immunity and detoxifies. A couples’ treatment in the new collection – Siam Lovers – combines a nourishing coconut oil and jasmine rice scrub with an Earth Energy Four Hand massage, and tops the experience off with a fragrant rose bath in the spa’s alfresco foliage-fringed tubs. The deep respect the resort pays to its natural habitat also extends beyond the shoreline, where aquatic treasures lie beneath the shimmering blue surface of the ocean. The waters around Four Seasons Resort Koh Samui are home to vibrant coral gardens and rich marine life ­– from rainbow fish and sea anemones to panda butterfly fish, Bengal sergeants, sea urchins and hermit crabs. Led by a team of in-house marine biologists, guests can embark on a snorkelling journey along the reef that adjoins the resort. A coral conservation initiative was also launched at the resort – a first for Koh Samui – in partnership with the Department of Marine and Coastal Resources (DMCR), the Department of Fisheries, Koh Samui Municipality, the local communities of Bang Por and Bang Makham, and the Maikhao Marine Turtle Foundation. Guest are invited to immerse themselves in the fascinating world of coral regeneration, where broken coral pieces are picked up from the reef and then rehabilitated in special “coral nurseries” before ultimately being transplanted to an underwater platform. Offering all the indulging trimmings one would expect from a Four Seasons resort – impeccable service standards in refined surroundings, coupled with authentic destination experiences – it’s evident that you’ve arrived at a place that cherishes its very special location.